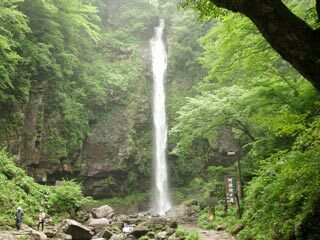 Amida Falls (阿弥陀ヶ滝, amidagataki) is one of 100 best Japanese waterfalls located in Gifu pref. It is about 60m high and 7m wide. It is also chosen as 50 best water of Gifu. The landscape of this waterfalls are designated as the view of Gifu, and even the famous artist Katsushika Hokusai made his painting of this falls. It was found in 723 by priest Taicho. He named this Long Falls. Later, it became the practice place of buddhist monks. In the middle of 15th century, one priest had enlightenment at this falls. Then, he named this waterfalls Amida Falls.